The mixSorb SHP (high pressure) was designed as a special device series especially for applications in the natural gas sector as well as gas storage studies on new materials under high system pressures (up to 68 bar). For the investigation of new materials for the purification of natural gas for the separation of higher hydrocarbons, for drying and further investigations pressures up to 70 bar are necessary, in order to reflect the technically relevant system pressures. In the field of gas storage studies are on the one hand the reversibility (loading and unloading of an adsorptive gas storage) and on the other hand for possible, undesirable enrichment of impurities of the gas to be stored required. For adsorptive methane storage (ANG), for example, pressure ranges up to approx. 40 bar are frequently investigated. Another application is the adsorptive purification of reforming gas for hydrogen production. Technically, these processes are carried out at system pressures of about 30 – 40 bar. Also in this case novel materials for this application should be examined in the mentioned pressure range. 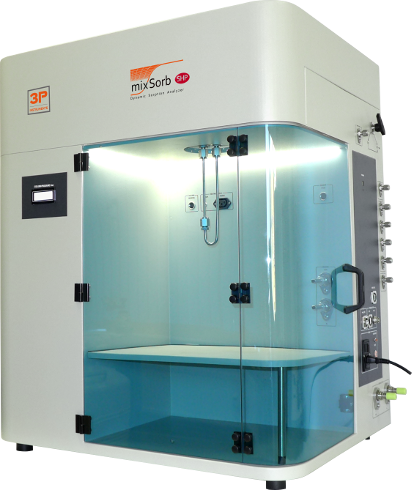 The fully automated mixSorb SHP is controlled by the mixSorb Manager PC software. In this software, a large number of sequences, which can differ in terms of all relevant parameters (temperature, pressure, gas velocity or residence time, gas/vapor-mixture concentrations etc. ), are lined up and completely automatically measured according to the selected procedure. With the available vapor option, up to two completely independent evaporator systems can be used fully automatically to generate the most complicated gas/vapor-mixtures and thus to derive even more comprehensive information about co-adsorption phenomena or displacement effects from the measured data. The corresponding modeling software 3P sim enables the calculation and adaptation of pure gas isotherms as well as breakthrough curves and the precalculation of mixture equilibria.